Roaming through Rome at Crabapple Kitchen | 15,000kms of Food! When I first heard about the “Friday Night Flights” at Crabapple Kitchen I just had to go. $45 for 6 courses with a travel destination theme (rotating every 2 weeks). So with great anticipation, we went to “Roam in Rome” which was one of the best dinner I’ve had this year. The food was inspired, and I felt like I went on a mini holiday. Cocktails, beer and wine to match the theme of the night added to the atmosphere. 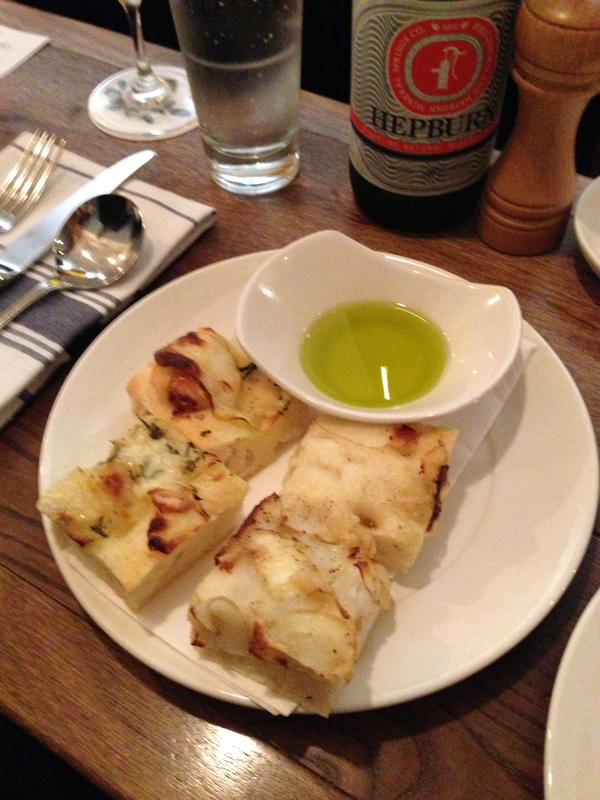 We started with “Pizza Bianca – focaccia style bread with potato, garlic, Fontina and rosemary“. It was perfectly fluffy focaccia with paper thin slices of potato and cheese and sprinkled with sea salt. Delicious. 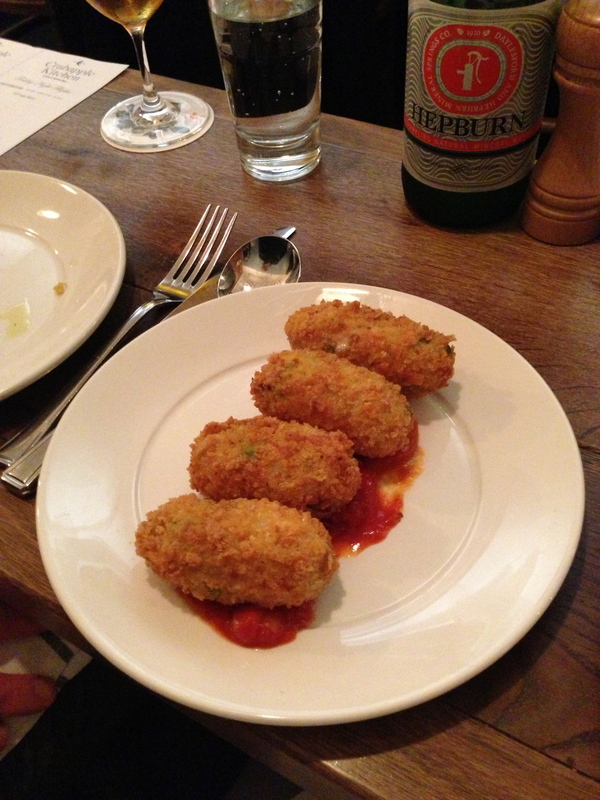 The “rice croquettes ‘al telefono’ with peas, ham and Mozzarella di Bufala” was my favourite dish of the night. The croquettes were crispy outside, with perfect risotto on the inside. Loved it. 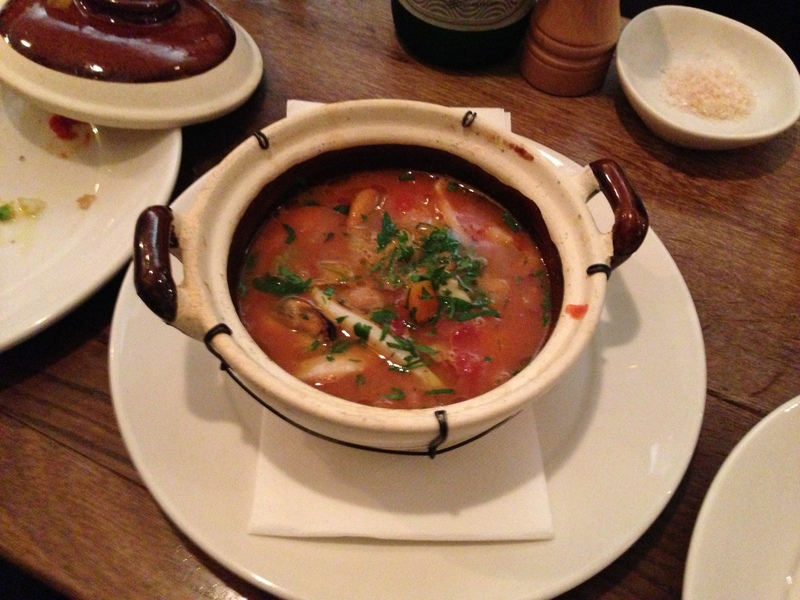 The “Borlotti bean soup with shrimp, calamari and mussels” was a rich hearty soup which a lovely seafood taste. Who can resist a good slow cooked meat dish? 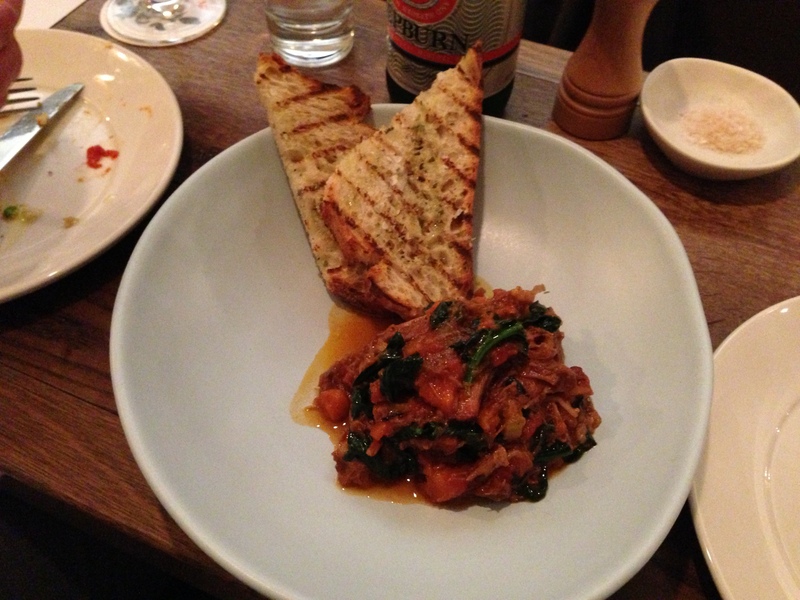 The “Coda all vaccinara – oxtail stew ‘Quinto Quarto’ braised the butchers way and cavolo nero” was all that. Slow cooked, tender meat with a rich tomato base and accompanied by toasted salted herb bread. 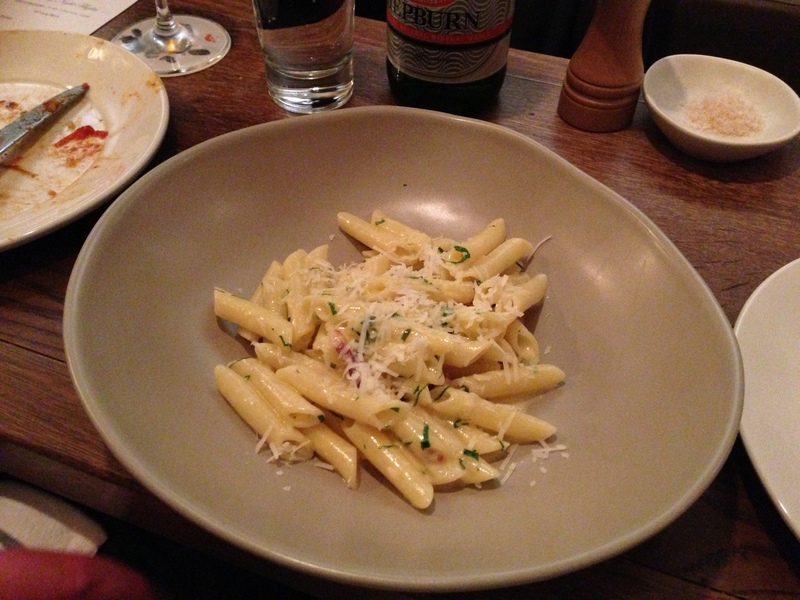 The”Penne Cabonara ‘Coal Miner’s Dust’ with pancetta, Pecorino and a touch of cream” was great – perfectly cooked pasta, was a lovely light dish, and hit all the right notes (mmm salty pancetta). 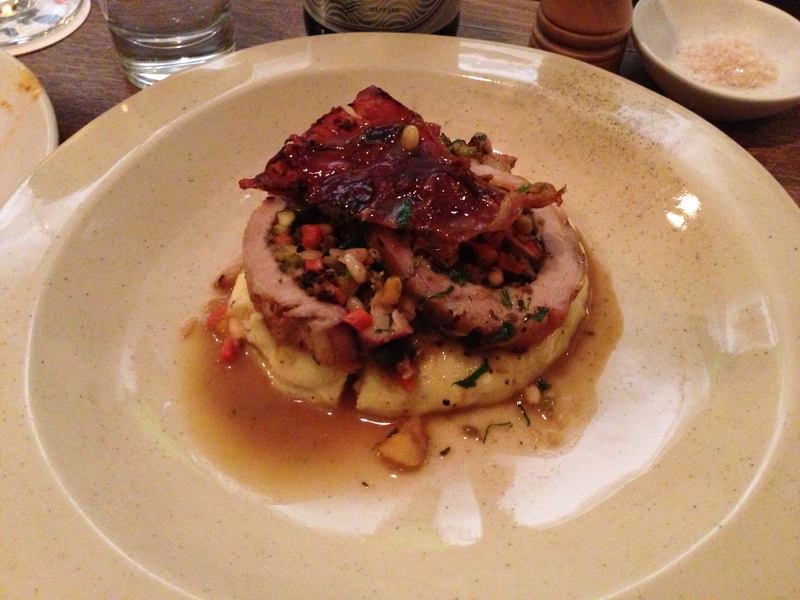 Finished the dinner with “Pork ‘Agrodolce’ – the flavours of Saltimbocca with firm polenta and sweet & sour sauce“. Wonderfully cooked pork stuffed with fruits and nuts, with creamy polenta. All very good. So dear reader, where does this leave us? A delicious dinner at an event which will not be repeated in the foreseeable future. I would highly recommend it and would go back in a heartbeat (we’ve been back twice for two other destinations!). So, if you get the opportunity anytime soon to attend “Friday Night Flights” – do it!